GRAPEFRUITCRAZY: Love locks - tender token or eyesore? 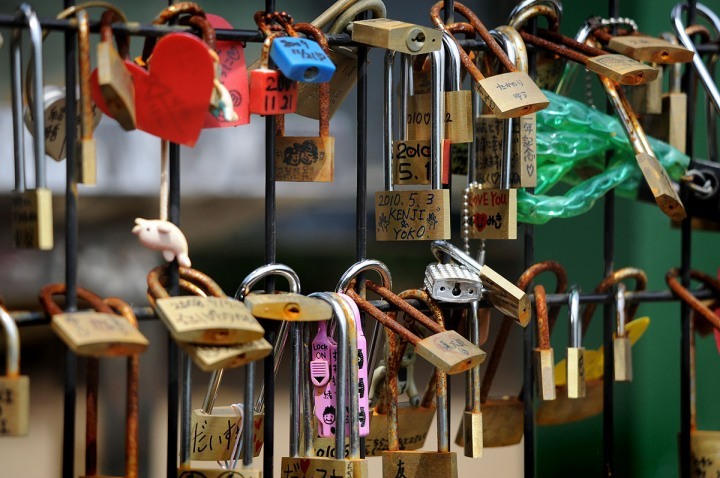 Love locks - tender token or eyesore? Why haven’t I seen any love locks in London? Until today I’d never even heard about the custom where lovers write their names or initials on a padlock, attach it to a bridge or some other structure and chuck the key in the water as a symbol of their everlasting love. Apparently the fashion has been around a while, found across the world and has grown to a degree where some local authorities in places like Paris and Venice consider it a menace – unsightly and potentially damaging. I’m neither young nor in love – of the two, if I could choose, I’d settle for the latter – but I am a pretty observant person. Surely I would have spotted a random alfresco padlock let alone an epidemic of the things? These love tokens would make a welcome change from the depressing symbols I most come across. The bunches of now-dead flowers marking the site of a cyclist come to grief; the diamonds of broken glass where a car once parked with a laptop on its back seat; railings wreathed with garbage bags, local councils’ contribution to the re-cycling movement. Usually if you spot an abandoned lock, it’s because the bike it once secured has been stolen. Carrying a knife into a public park with the intention of carving your lover’s name in a tree probably now carries a mandatory prison sentence. A tattoo makes you a hostage to fortune and expensive laser treatment. So how much better then to fasten a lock to a bridge? But one person’s street accessory is another’s vandalism. When I get to Venice, as I hope to shortly, I’d like to see the Rialto Bridge as Canaletto saw it and not dressed up like a canal-straddling Transformer. The Millennium Bridge which crosses the Thames at Tate Modern apparently has attracted lovers hot foot from a hardware store with a padlock to declare their eternal passion. I’ll have to check it out. When the suspension bridge first opened it had to be ‘doctored’ because people complained its sideways movement made them feel giddy – a sensation not unlike first love. Luggage locks wouldn’t have done it for the Victorians. Their Dearest and Regard rings speak to the true romantic. The initial letter of each gemstone spelled out the words either Diamond, Emerald, Amethyst, Ruby, Emerald, Sapphire and Topaz or Ruby, Emerald, Garnet, Amethyst, Ruby, and Diamond. Now that’s real style. Should child murderers and police killers hang?